I didn’t start playing PC games until very recently. Sure, I have a gaming resume full of obscure Asian MMORPGs, but that isn’t the core of western PC gaming. I didn’t have the thrill of experiencing Diablo or Diablo II when they first hit the shelves years and years ago. Because of this Diablo void in my life prior to May 2012, I never built up the nostalgia factor for Diablo II. I never had a chance pour countless hours into a game only to be rewarded with a seemingly meaningless item. But, now it was my time to enjoy the grind for all of its worth. My time to figure out why so many people have figuratively chased the carrot on the stick. My time to become one of them. But one cannot grind without proper nourishment. So, here’s a quick and simple Demon Hunter dish that can be made before your Nephalem Valor runs out. Prep time will be about 15 minutes. Cook time to reduce the balsamic vinegar is about 5 minutes. 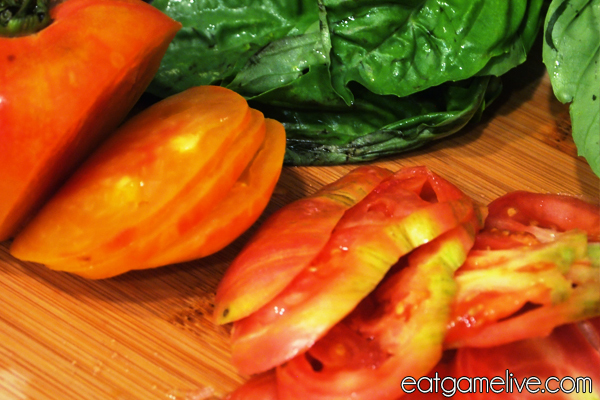 Wash and slice your heirloom tomatoes into thin slices. Cut your basil into thin strips. Roughly chop your buffalo mozzarella. Pour 1 teaspoon of balsamic vinegar into a small sauce pan. 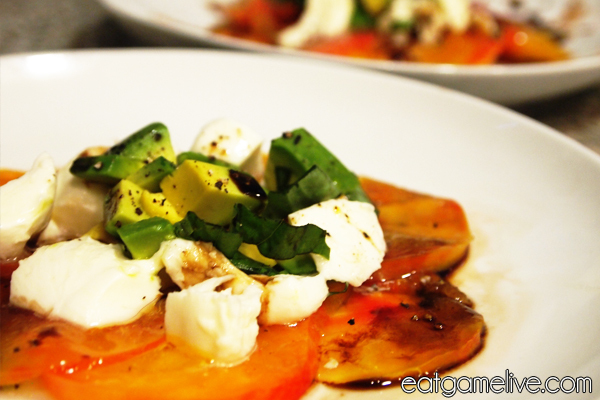 Now it’s time to assemble your caprese salad. Place your tomato slices on a plate. 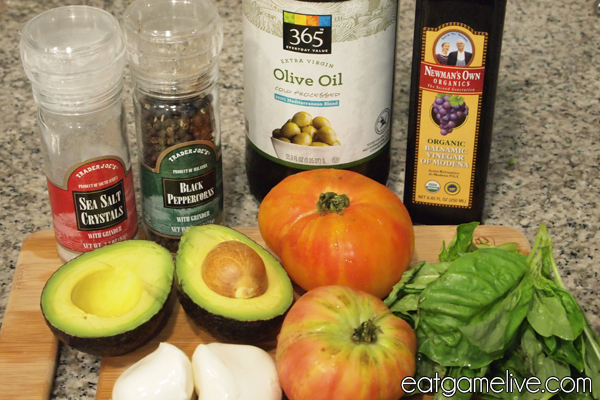 Sprinkle a little salt and pepper over your tomatoes. Place avocado on top. Sprinkle with a little salt and pepper. Sprinkle chopped basil over the salad. Finish with a drizzle of reduced balsamic vinegar and olive oil. And that’s all it takes to create this simple dish. Now, back to item grinding. Those legendaries aren’t going to find themselves, now are they? For what it’s worth, I’ve enjoyed my time playing Diablo III. The 200 and some odd hours spent in the realm of Sanctuary have been fun for me. Arguably, Diablo II and Diablo III are very different games. And yes, people have very strong opinions about each game — but I don’t let that bother me. The game is meant to be played, not bickered over. But, to each their own, right? I like Diablo III and will continue to support it. Now, if you’ll excuse me, I’ve got a carrot on a stick to chase. This entry was posted in appetizers, diablo, vegetarian and tagged avocado, caprese, Demon Hunter, Diablo III, salad, tomato by admin. Bookmark the permalink. Your website must give you a clear message having a goal-oriented direction, setting you apart from your competitors. as being a writer plus working with drop shippers in a variety of entrepreneurial ventures. Furthermore, my experience includes identifying the competitive advantage for a few different companies and crafting that advantage into a online marketing strategy to develop start up business. Businesses will be to heavily dependant upon customers for his or her survival, without customers a business would cease to exist. test of your energy. Investors are there to assist the entrepreneur and to gain a make money from their investment from your entrepreneurs company. inform you, Ameriplan is not a scam. them. it also can be used for headhunting and employment. goal-oriented direction, setting you apart from your competition. She invites you to definitely visit her site where she will share a proven method to start an web business. ll possess the practical guidance you will need on how to start a concierge business”. offered up three questions you must use as a focal point when creating a business model. also there exists no certain method in order to avoid gallbladder. is emerging and what these two markets represent. become reduced substantially and could walk farther pain free than normal.